Here is my Marlin 336 ER in 356 Winchester. The ER stands for "extremely rare" - just kidding! 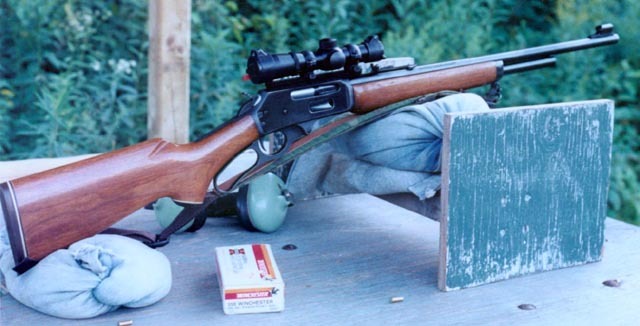 It really stands for "extended range" but the rifle is quite rare as only 2441 were ever made. I bought the first one I saw for sale and have never seen one since. I've come across quite a few Winchester big bores in 356 over the years but not Marlins. I like it alot even though the wood and metal look somewhat worn. It was like this when I first acquired it. The previous owner claimed he had downed two moose with it. I have killed two bears with it with modified 250 gr. Speer spire points nipped off flat at the nose (weighs about 247 gr. after this ) and at about 2300 f.p.s. They both died in seconds - one travelling about 8 yards and the other about 12 to 15 yards before expiring. In every way this is a gun for "go" not for "show". It is perfect I think in a tree stand and for fast action on the ground when necessary. Because I use it in brush and over bait, I find that this low power and light (7 oz.) Simmons shotgun scope works well. Check out that long eye relief (6"plus). Never a problem with gettin a third eye in the forehead with this set up! Notice that no hammer spur is needed due to the way the scope eyepiece is actually ahead of the hammer. Lately I have been shooting a load with 220 gr. Speer flatnose bullets exiting the muzzle at just over 2300 f.p.s. My last 100 yard 3 shot target was 1.75" from a rest (see pic of me shooting it left - no my rifle's not a "yellow boy" - my camera was acting up). 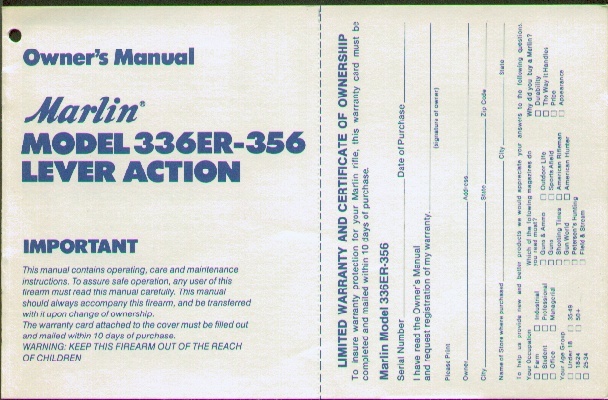 Click here to see how to get a 336 Marlin lever in 358 Winchester - yes 358!!! This is a pic of a friend's rifle in 8mm-06! That's a Hodgdon's load manual with it. The Ruger factory stock began life wrapped around a heavy barrel varmint rifle (25-06 I think I was told when I bought the stock). I adapted the stock to drop in a 98 barreled action and then lost interest in my project. I then passed the stock along to a friend with an idea for a scout rifle. He and a Callender, Ontario gunsmith rechambered a 8mm military Mauser, bedded the metal in the wood, and this is the good result. This gun has recently moved along with my friend to the Northwest Territories of Canada. No doubt it will see some awesome big game hunting in coming years. Since I'm a 35 nut, I'm duty bound to say that if the bore was just about another .035" larger it would be even more perfect. Nice gun Roger! God bless you and your family. Happy hunting! P.S. - March 2005 update - Roger is now having this one rebarreled to 35 Whelen!!! He wants it to hunt sheep but take a griz if the opportunity presents itself. On a combo hunt sometimes the griz appears when it's not supposed to and the hunter can be typically under gunned. The 35 Whelen with proper bullets and loading should provide an acceptable margin of flexibility with brownie lethality. Roger also owns a 416 Remington Magnum to carry exclusively for griz after he has filled his sheep tag. P.S. 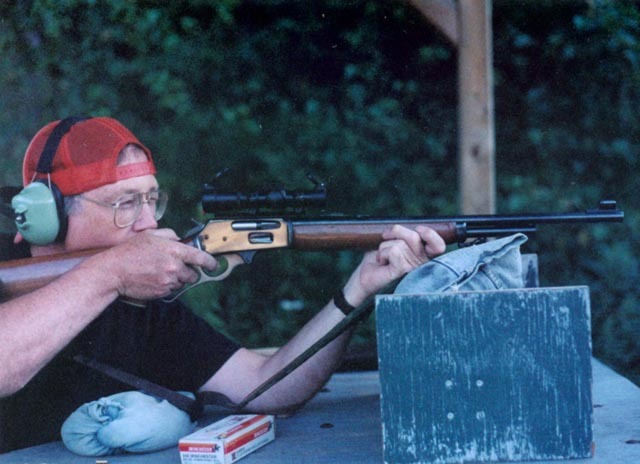 - April 2006 update - Roger's mauser pictured above now looks completely different (see link to pics directly below). It is now a full custom 35 whelen launching 250s@ 2600+fps with a 24" McClelland tube and Rel 15. He shot a Woods Bison last fall (2005) with it in the 2000lb category and several 400lb category caribou along with some other smaller ones. He is very happy with the rifle's performance on big game. 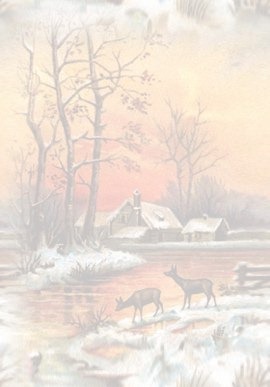 He has sent me some photos so I can publish them here. April 2006 - Here's a pic of a shooting friend's recent purchase - a gently used (hopefully) custom Sako rifle in 35 Whelen. It's wearing a Douglas barrel he informs me. Also it has a muzzle brake as the pic shows. He will be getting it from the gunshop soon he hopes. He has it safely stored there on layaway purchase plan for now. He sort of "lucked out" on this one. There are few left-handed 35s in the world. I wonder if his pump 35 Whelen will be left at home lonely when he starts shooting this one. If permitted, I hope to publish here some of his range results when he gets crackin with this "beaut". It should be a shooter!!! I know all you lefty 35 cal fans are envious! 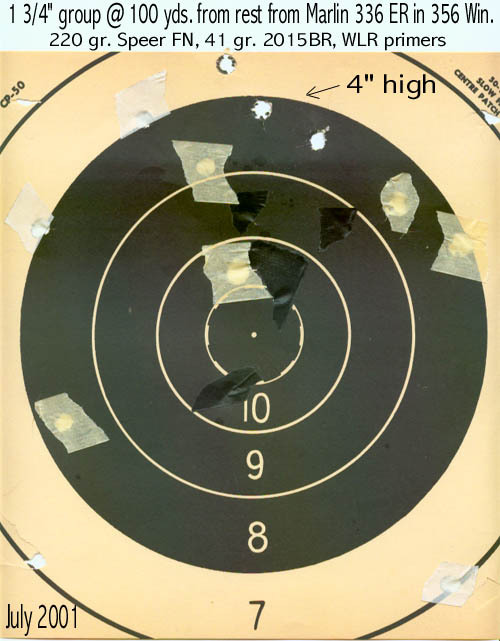 "I was out this weekend with my lefty .35 Whelen and got some interesting results. After the scattergun performance of its last range session, I made damn sure the action screws were tight! Anyway, using 56.6 grains of Reloder 15, 250 grain Partitions went sub 1 inch (around .75"--1.0"), and about 1" to a little larger with Sierra 225s and 225 Ballistic Tips...I may just stick with the Partitions and Ballistic Tips with the listed charge for good now." 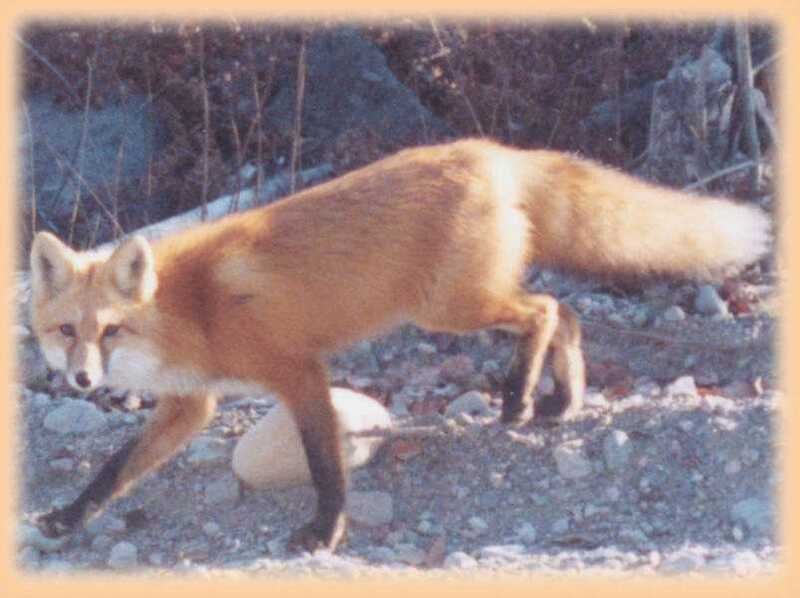 I took a pic of this photogenic fox last fall (2000) while moose hunting just north of Sudbury. 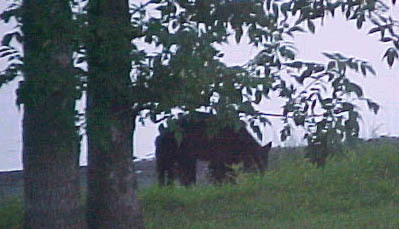 Click here to download an unusual bear encounter - it's always surprising what a bear may do next! My friend Mike photographed this young bear this past summer (2000) with a company camera (your secret's safe with me Mike). 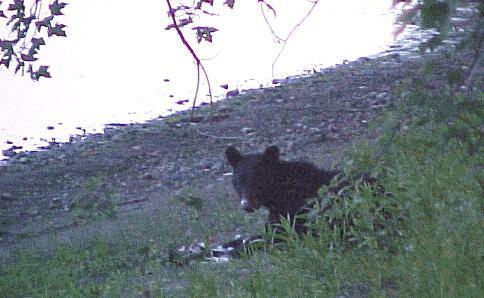 He snapped these shots at dusk by the water's edge in front of his house near Walden, Ontario. Hey Mike - be careful getting too close to those bears - especially with nothing in your hands for battle except a digital camera! Good pics considering the poor light conditions. Thanks for sharing them with me. 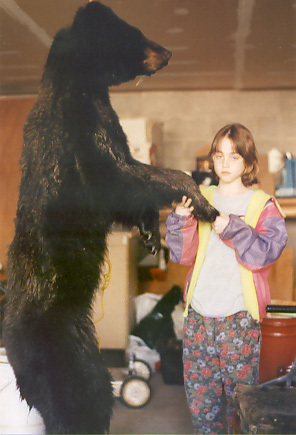 One of my daughters saying "howdy" to a Bobcaygeon, Ontario black bear I shot.